Silly and filled with twists and turns, but not scary. The books are overall pretty light reading, but that can be a plus for young readers. Life isn’t easy when you have a zombie goldfish for a pet, but Tom and his best friend Pradeep are rockin’ it. Though having a pet with hypnotic eyes poses some interesting problems, they manage to keep Frankie from getting into too much trouble – and away from the hungry jaws of his big brother’s vampire kitten. 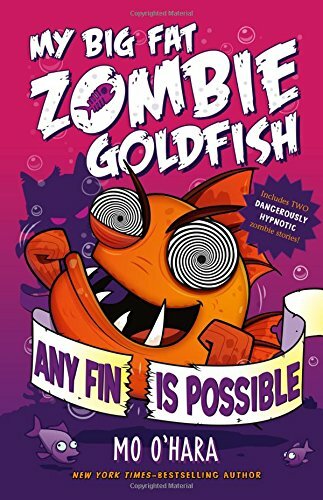 Any Fin Is Possible is the latest installment in the popular My Big Fat Zombie Goldfish series, and it’s just as action filled as you’d expect from a zombie goldfish. 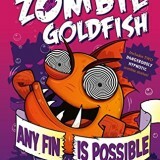 The book contains two separate zombie goldfish stories. The first, The Curse of the Cat of Kings, starts out when Tom and Pradeep do a sleepover at the museum. Something is going on at the museum, and it all has to do with an ancient mummy that will soon be revealed to the public. Though Tom soon figures out there can only be one person behind all the shenanigans, he’s going to have to face some fearsome ancient Egyptian booby traps if he wants to save Pradeep. The second story, Sports Day Showdown finds our fearless duo on an unexpected trip to a sports day. Though they aren’t generally the sporty type, this sports day also includes academic activities – and Pradeep is pretty psyched for the chess competition. Of course, it wouldn’t be a day out with Frankie if some scheming older brothers and their vampire kitten didn’t show up. They’ll have to both outsmart Mark and keep their teams in the running if they want a shot at making it through the day. Any Fin Is Possible is a great addition to your elementary child’s Zombie Goldfish library, with plenty of the twists, turns, and overall silliness you’d expect from the series. For those unfamiliar with the books, you’ll have no trouble just picking up this book without any of the previous installments (though you might be a bit curious about how the whole zombie goldfish thing came about in the first place). The books lead kids through stories that are playful and action filled, but not scary. They’re a great way to get kids hooked on reading, and Any Fin Is Possible will not disappoint.